A comfortable harness with good ergonomics. Utilization for works on constructions, pylons and evacuations of persons. This harness can also be used in the area of special forces - army, police, firemen etc. 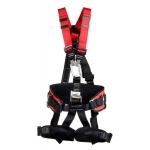 Safety harness PROFI - rear and front attachment points - ring for rescue of persons, evacuating or rappelling - positioning belt with side rings - adjustable shoulder, thigh and back straps. The harness is available also in PROFI design which differs from the PROFI design in buckles that make putting on of the harness easier.